That's over 25 years in the Entertainment Business. Now, Leon is one of Ireland’s most sought-after magicians. A Professional Magical Entertainer who has won numerous awards and has entertained at many Events and Weddings all around the Country. He has appeared on UK and Irish TV, RTE One, RTE Two, TG4, TV3, Channel 4, E4 and More 4. He has also guest appeared on Numerous Radio Stations and has performed for International Super Stars Like Boyz II Men and Lots of Irish Celebs From Keith Duffy (Boyzone & Coronation Street), Brian and Pippa Ormond (TV Presenters), (An Taoiseach) Enda Kenny to Emma O Driscoll and Children’s Puppet Socky the Sock Monster on RTE Two Children's Show, to name a few. Wedding Entertainment With A Touch Of Magic. WHAT THE *BEEP*?, WOW, OH MY GOD! & DO THAT AGAIN! These Are Just a few words your guests will be saying when they see Leon perform. Leon specialises in WEDDING MAGIC. At this point, while you are having your most important pictures taken, Leon will bamboozle your guest and will make sure everyone is having fun. Performing for up to 2 hours before the meal starts, he is always on hand to take the pressure off. Leon performs all over Ireland and the UK and can be booked directly by filling in the form Here Contact Us Page. Bare in mind, Leon gets booked months, even years in advance and prides himself on being 100% reliable by performing only 1 Wedding per day. Your Guests will be talking about your Wedding Day for a very long time. For Prices And Availability Please Contact Leon Today. Coming from a sales background Leon incorporates your company's slogan/ logo into magic effects. Making lasting impression on your clients who then will talk about it for a long time. I know exactly how important it is to keep every clients happy and entertained. While mingling from table to table, group to group Leon's magic has the ability to get people talking in seconds. they won't believe their eyes. Contact Leon today for more info. Leon focused on putting together a Fun, Family Magic Show for Children, Teenagers and Adults. Leon involves the 'Star of the day' & other children to make sure everyone is having FUN. 1. 1hr Magic Show Packed with Laughs and Audience Participation for the whole Family. 2. Three hours of Music, Games, Dancing & Magic for all the family. Kids can also sing their favourite songs. 3. Add on's, are available. eg. Nail Art, Face Painting, Balloon Molding and Video DJ. Magician Leon Has Added Another Option. Performing magic for TV is completely different then performing stage or close-up magic. Style, Look, Attitude, Speaking voice all have to be worked on as well as the magic tricks themselves. TG4, RTE1 & 2, TV3, C4,E4 & More 4 and with over 180K views on YouTube, 12k followers on Twitter and over 10k Followers on Facebook. "I'm excited about whats going to happen next". Leon has worked with Jay Sankey, as a mentor on his Inside Deception programme, released original magic effects with Penguin Magic & Murphys Magic and has a New Effect Coming out real soon Called 'FaceLift' he has spent the last 23 years in the entertainment business. Leon can advise on Stage, Close-Up and TV. Contact him for a chat. Suitable for 30th/40th/50th & 60th's Birthday Parties. A Lover of Music all my life, I specialise in 80's and 90's Music. I am now taking booking for 2018. Contact me NOW. "Class Magic" is a Fun, interactive workshop that increases the interest of using numbers and creating stories outside of the classroom by learning simple magic tricks. Other Benefits are increased Self-Esteem, Self-Confidence and Social Skills, Memory, Eye-Hand Coordination and Sequencing to name a few. Each workshop lasts for 40 minutes and can have up to 30 students per class. Class Magic would be suitable for all Junior Cert Students and TY’s and can give them a great sense of achievement. This workshop has been tried and tested in schools all over Ireland for the past 5 years with Amazing results and feedback. 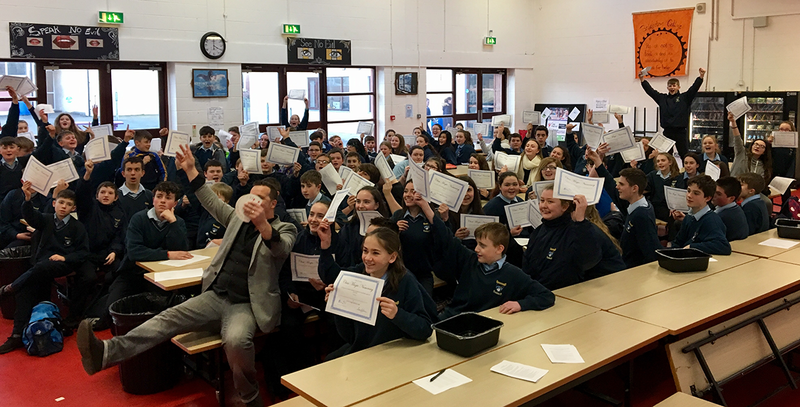 On Monday 23rd January 2017 magician Leon Andersen visited the school to work with our first-year students. He performed card and number tricks and later explained how he used numeracy skills to create and develop each trick. He encouraged all students to use their numeracy skills and to try out the magic tricks themselves. The workshop was a great success and was greatly enjoyed by all students. Many thanks to Leon for taking the time to visit our school. For a quote and availability please contact Leon TODAY. (Instant Download) This trick fooled Michael Ammar.. so your poor spectators have no chance. If you would like to purchase a 3 pack of Leon's Facelift. Click on the button below for a list of venders I recommend. Please mail me with any questions. I'm here to help!